Faster, newer, better - we've all grown accustomed to expect that the latest iPhone will be the fastest iPhone yet. The replacement of a 16GB base version with a 32GB was one of the welcome and well overdue changes that came with this year's generation. But little did we know that this move comes with a caveat of its own. Our benchmark tests so far point us to believe that the 32GB model has, in fact, a few times lower storage performance compared to the 128GB model of the iPhone 7 and the 64GB model of the 6s Plus, which we have available for comparison. Using the free Basemark OS II benchmark from the App Store we ran multiple tests and the iPhone 7 Plus 32GB never scored more than 800 or so points in the Storage department as opposed to the 1300-1700 points we got from the other iPhones we have. Since the storage results under Basemark vary greatly from test to test, we decided to include another benchmark - by Pass Mark. This benchmark revealed that the iPhone 7 Plus 32GB does badly in the Write portion of the test as otherwise its Read performance is about as equal to the iPhone 6s Plus. But benchmarks are synthetic, and we wanted to see how this slower storage relates to real-life performance. So we came up with the following test: we shot a 10-minute 4K video with the iPhone, and we then trimmed it exactly in half using the built-in trimming feature of the standard Photos app. We then timed how long it takes the three iPhones to complete the operation of saving the trim as a new file. It's a great test as it's a task you might find yourself occasionally doing and also it involves both reading the original big file (3.3GB) and writing a fairly big new video file. And boy, what a difference - the 32GB iPhone 7 Plus was three times slower than the 128GB model! And did you see the difference in the PassMark Storage Write rating between the 32GB and 128GB version? It's almost 8x. Of course, we didn't have a second unit to verify our findings so we can't dismiss the possibility that our review unit is faulty (though it's a store-bought retail unit). Apple could also be using different vendors for its storage chips so the difference in storage speed could be due to the chip maker and not the difference in size. But regardless of the reasons, storage is a crucial aspect of a phone's overall performance, and we wanted to get this out in public as soon as possible. We're sure many other people can do further testing, and we'll get our answer one way or another. 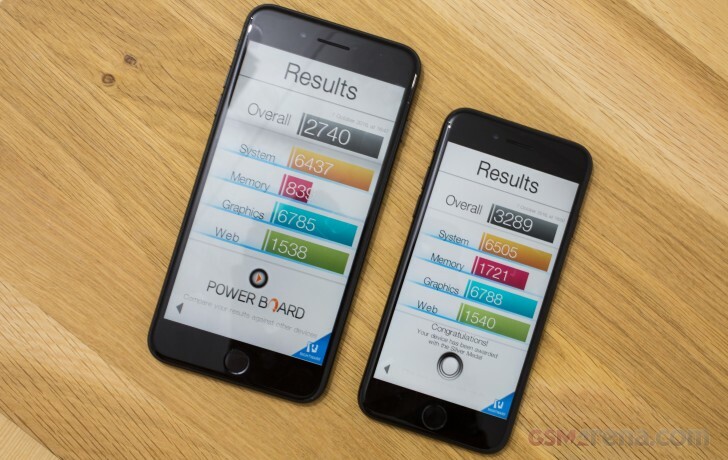 If you have the 32GB version of any of the two new iPhones, hit us with your benchmark scores in the comments below. We'd like to get to the bottom of this. I have an A1778 but it is a 128GB model. Hmm. I thought ive read about this so i tried the test myself when iupgraded my iphone6s to iphone 7 32g and it did give me this result!!!! Wtf! And the battery apple claimed to be better is actually worst on my new device !